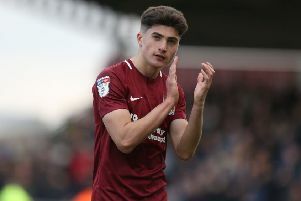 Cobblers manager Aidy Boothroyd has revealed he was heading straight to Northampton General Hospital from Sixfields to see striker Alex Nicholls, who is tonight having an operation on a double break of his left leg. Nicholls sustained the horror injury in scoring Cobblers opening goal in their 2-0 win over Port Vale folowing a desperate lunge from Valiants skipper John McCombeand Boothroyd confirmed the frontman is now likely to miss the remainder of the season. He said: “Alex has got a compound fracture of the fibula and the tibia. He’s having an operation tonight and I’m going straight there now. His mum, dad, wife and baby girl were down here for the match today and saw it happen, they’re at the hospital now with him and that’s where I’m heading too. “We’re absiolutely gutted for him. It was a brave goalscorer’s goal. John McCombe didn’t mean to cause the damage, I’m convinced of that. He went for the ball and it’s one of those where he has just come up to me to apologise for what’s happened. “It took the edge off a fantastic performance and a terrific victory for the lads that were out there. I threw something different at them with the three at the back and it worked. They responded well, we got two and it could have been three, I don’t know what the other one was disallowed for. “Today was our day in terms of the result but all our thoughts are with Nico. I’ve been there myself, I’ve broken a leg and I know what it’s like. Nicholls’ strike partner Adebayo Akinfenwa, who was just yards from his partner when the injury happened, said: “It’s an eerie feeling. All our prayers and wishes are for him now. He wished us good luck before he went off for his operation and that’s the kind of guy he is. He’s good peoples man, he’s good peoples. “I’ve played against McCombe many times and he didn’t mean that, he’s not a malicious character. Sometimes that happens, it does put football into perspective.